I'm trying to create a way to keep track of our jobs by creating a Google spreadsheet. We can only order our final product when the digital and hard copy proof is approved and we have an order from purchasing. 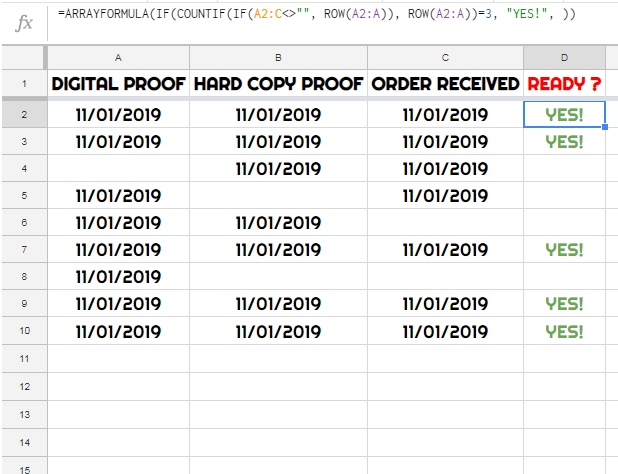 I have columns created for digital proof approval, hard copy proof approval and order received. Is there a way to out fill a 4th column called Ready to Order after all of the other columns have something entered in them? How to capture a cell when entered or selected? AutoFill Large Number of Cells in Google Sheets? Combine text from multiple cells into a single cell on other Sheet?